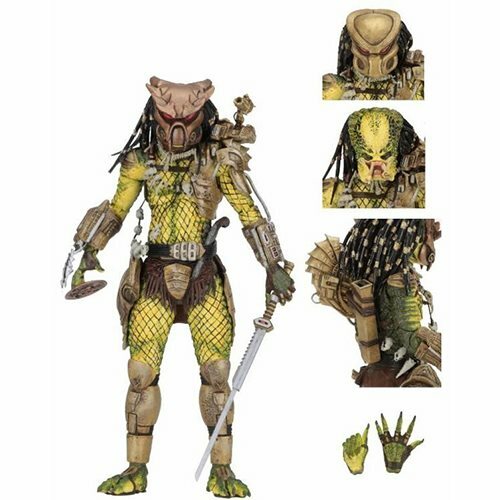 From Dark Horse Comics' Predator: 1718, comes the Predator Ultimate Golden Angel 7-Inch Scale Action Figure! One of the most memorable moments in the 1990 film Predator 2 is when the Elder Predator gives his flintlock pistol to Detective Harrigan as a sign of respect. Predator: 1718 reveals the story of how Golden Angel originally acquired the pistol. The figure comes with 3 different heads, alternate hands, trophy necklace, smart disc, shoulder cannon, sword that fits in a back sheath, and flintlock pistol that tucks through his belt. Stands approximately 8 1/4-inches tall, with over 30 points of articulation.